We really loved the entrance. I was afraid it would be cheesy but it wasn’t. The restaurant part was beautiful. We loved the attire for the wait staff. Excellent cocktails. Was disappointed that we saw a smoked bourbon being prepared at a table but ours wasn’t. Waitress said that it’s only done at the bar but we saw differently. Waitress hopefully was just having an off day because she was not engaging or attentive. Had some interaction with other wait staff who appeared to be delightful. Overall, definitely worth a visit! Great food and drinks with a cool atmosphere. Drinks were top notch, food was great, atmosphere was very fun! Outstanding!!! I’ll definitely dine here again. 4 of us went to check this out, very much anticipating a great experience. We were not greeted with any enthusiasm by the hostess, the server seemed to not want to be waiting on us, despite the place being quite empty. The prices were comparable to what you would expect from a nicer place, but were not justified for the service or lack of attentiveness by the staff. The food was good, but didn't wow us enough to return. Fun concept, lively bar scene, food was inconsistent - some exceptional and some was above average. The service was great, and the food was outstanding! We had an excellent experience here. The food was terrific, servers were great, and the ambiance was very nice. We will be booking many more special occasions here. The enclosed patio is the best! You can be outside but not worry about street smells! Great food and amazing service. Drinks pricey but yummy! Nice atmosphere, cool place to go with the bootleggers theme. Food was delicious for all three dinners served. Waitress very helpful with recommendations and being attentive without interrupting conversation. Great place! Everyone loved the atmosphere and the food was great. We would love to get more vegetarian entrees on the menu but we will be returning. I was a little disappointed in the entry/ book store. I expected it to be more realistic of a vintage book store and not just a book shelf. The atmosphere was perfect, not to bright and not too loud. My friend and I could hold a normal conversation. The food was very delicious and well prepared. A little pricey. The only small complaint was the service. Our waitress only came to our table three times in the three hours we were there. Two of those times we had to stop another waitress to go get her; one so we could order our dinner and two for our check. Otherwise a really awesome bar and restaurant. I might suggest enforcing a stricter dress code. It would help to accentuate the vibe your going for. Celebrating my mom’s 75th birthday. Wonderful hand crafted cocktails and amazing food in a super cool atmosphere. Do yourself a favor and visit this establishment. WORTH IT!!! Love this place. Unlike other speakeasy's, they serve food. Extensive cocktail menu. Make sure you get the password from Facebook, or you better have a funny joke ready. Finding street parking can be a problem. Food didn’t have much flavor. The cocktails were a little light on booze. Service was decent. I enjoy Richmond’s food scene and frequent several restaurants throughout the city. 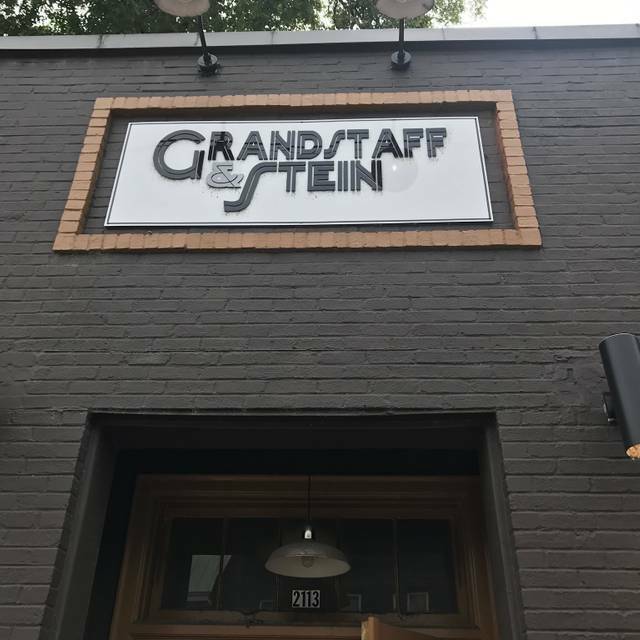 Grandstaff did not live up to what I’ve come to expect from a RVA dining establishment. Being a “speak easy” I didn’t expect the food to be as good as say, Roosevelt or Chez Foushee, but the cocktails didn’t do it for me either. Went for lunch so didn’t get the whole speakeasy experience. Food was excellent. Great crab cakes, duck wings were very tasty. Would love to go for dinner and get the whole experience. My girlfriend and I came and left early because we didn’t know it was Burlesque night, as we were looking for a quieter evening, our fault for not checking. However ee would come back in a heartbeat to watch the show. Always love the decor and vibe. We’ll definitely be back. It took about 30 minutes to be greeted by our waitress, and then another 15-20 to receive a drink. After spending over an hour there and having so little interaction with our waitress that we were only able to order 1 drink we decided to just leave. Went for my first time on a first date and this place is so underrated. Great decor and wonderful music, relaxing atmosphere, service was good. My date and I got one drink each. I tried thw rusty nail (I think thats what it was called anyways) and he got the smoked old fashion. We both enjoyed our drinks and we shared the brie bread app. Quality appetizer for sure. Server checked on us even after we paid and brought us more water without asking. It was a great experience. I will definitely be back. Thank you for the great experience. Food was real good just pricey for what you get and it's really no different from anywhere else. It's a good place to go for special occasions but plan on spending no less than $100. Fun atmosphere! Enjoyed the mules and dinner! We had a great time. Our service was on point and the food and drinks were amazing as always. Was seated quickly by nice hostess but for 10 minutes no water, no hello, no we will be with you, no waitstaff. They eyeballed us and everyone kept passing by our table. We left after 15 minutes as still no one came to our table. They were not packed and at least three waitresses passed our table without a word. The service was awful. We reserved through Open Table and apparently were supposed to have a password, but none was provided. We were greeted by a snarky receptionist who grumbled about Open Table and then sat us at a wobbly table. Our server was slow and smug. The restaurant has a cute concept but it's definitely not worth the eye-rolling attitude. 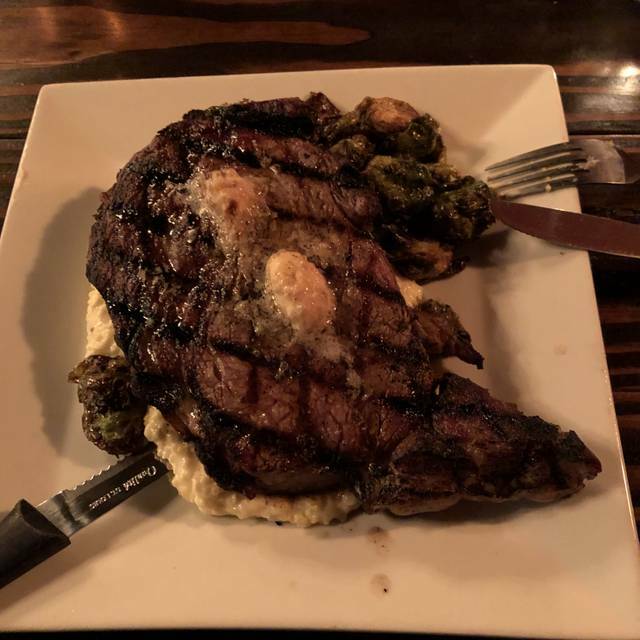 The NY strip was one of the best steaks I have ever had. My wife loved her grouper. 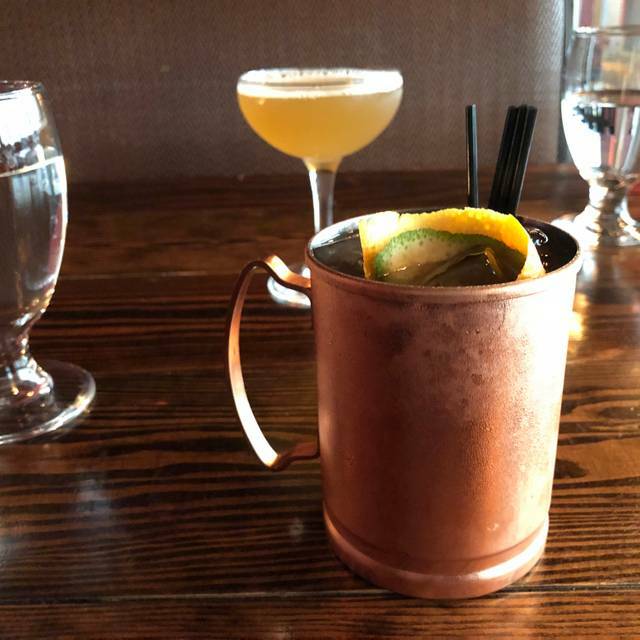 The bartenders make great mules. Great place, cool vib. First time here. You must know the password though. Throw back to yesterday drinks and great food. We had apps and drinks and definitely will be back. Waitstaff was great. Drinks were stellar. Food? Meh. I got the gnocchi after being disappointed the drool worthy vegetable pot pie was no longer on the menu. The huge pile of gnocchi were severely overcooked and literally stuck to the roof of my mouth. There wasn't much sauce, or many mushrooms or pine nuts (as described). My husband fared a bit better with his fried oyster appetizer and scallop dinner. We'd go back for drinks maybe but probably not for dinner. i was very disappointed with the food. Bland and boring. Beet salad - no flavor and the shrimp pasta was very buttery. Neat setup. 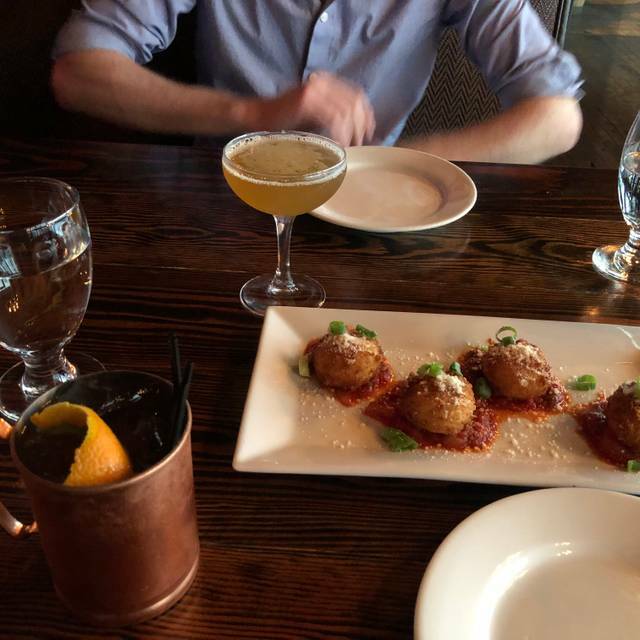 Great food and great drinks. The ambiance was really nice. The staff were attentive, and well trained. The food portions were small. Fun atmosphere. Good food and service. Would go back again without hesitation.